2019 OPERATION TIP-UP ICE FISHING DERBY!! January 18th & 19th, 2019 is Wisconsin Free Fishing Weekend!! No licenses required, bring the family out and join us for our fun-filled event! Saturday, January 19th there is a Free Ice Safety Seminar for kids 15 and under at 12 pm – 1 pm. Each child will receive a raffle ticket for the opportunity to win a 1 hour instructed fishing session with a Pro Angler from 1 pm – 2 pm. 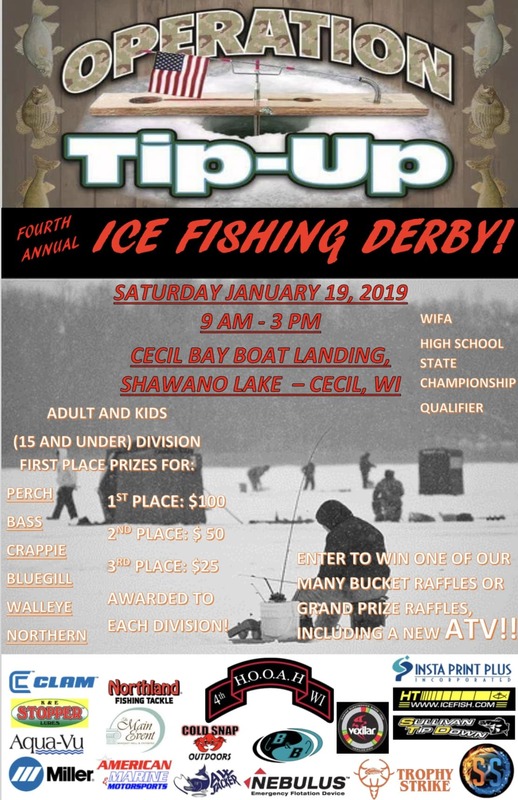 Be sure to mark your calendars for our 4th Annual Ice Fishing Derby to be held on Saturday, January 19, 2019, out of Cecil Bay on Shawano Lake. Anglers will compete to haul in the largest Northern Pike, Walleye, Bass, Perch, Crappie and Bluegill within the adult or under 15 age categories. Prizes will be awarded for the top 3 places for each species. Under 15: 1st-3rd Place receive great fishing prize packages! Raffles for numerous prizes will be held after the event at The Main Event Banquet Hall, including a 2019 CF Moto 800 ATV courtesy of American Marine and Motor Sports. Ice Fishing Wisconsin Pro Staff will be conducting a FREE kids clinic out on the ice from 1 pm until 2 pm teaching ice safety as well as basic fishing techniques and setting up for the big catch! 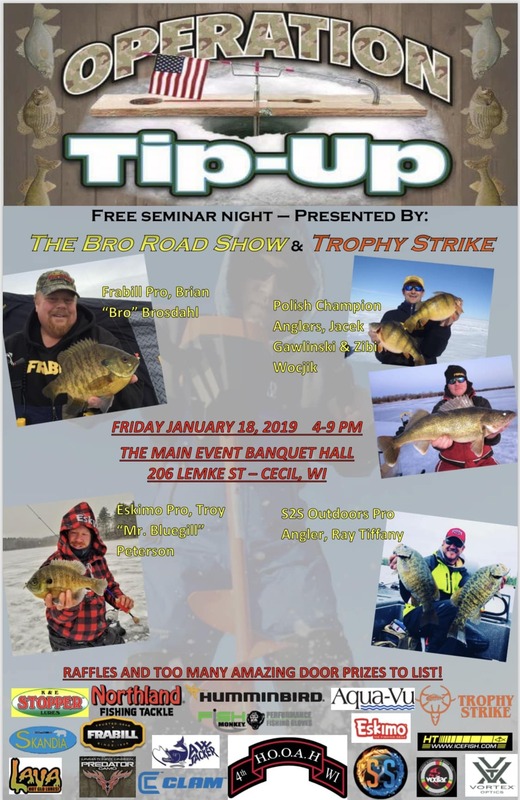 Seminars: Friday January 18th Brian “Bro” Brosdahl “The Bro Road Show” and Trophy Strike are sponsoring FREE seminars at The Main Event Banquet Hall at 206 Lemke St Cecil, WI 54111. The seminars will feature Pro Staffers sharing tips and techniques on hard and open water fishing, gear as well as an open forum discussion. This Pro Seminar will be from 4-10 pm. All proceeds will go to 4th H.O.O.A.H. Join us for great fishing, raffles, food and FUN! Click on the links below to register for the event, volunteer and/or sign up for the free seminars.